Cheese making has a long history in and around the Petaluma area; Marin French Cheese was established in 1865 and, today, is one of many artisan cheese makers that are attracting cheese aficionados to our region. The landscape of our local cheese industry continues to evolve as more cheese makers enter the scene and a wider variety of artisan cheese styles become available. As a lover of cheese I am grateful to live in such a dairy blessed corner of the world but confess to being intimidated by so many choices. Thankfully, we don’t have to go far to consult cheese experts or even visit the cheese makers themselves to learn more about this delicious local delicacy. For those of you looking to put together a cheese plate that will perform on any occasion here are some of Marie’s suggestions: a soft-ripened cheese, try Cowgirl Creamery’s Mt. Tam, a favorite that is “festive and easy to enjoy”; an aged nutty cheese, choose from the award-winning Pt. Reyes Farmstead Cheese Co. Toma, Valley Ford Cheese Co. Highway One, or Cowgirl’s Wagonwheel; a fresh goat cheese like those offered by Redwood Hill Farm; then round things out with the “fragrant but still mellow” Nicasio Valley Cheese Co. Square or a limited edition Bellwether Farms Sheep cheese. And, don’t forget some tasty local accompaniments like olive oil roasted almonds with herbs from Napa’s La Saision or a The Girl and the Fig mostarda made from Nana Mae’s Gravenstein apples, figs and raisins. 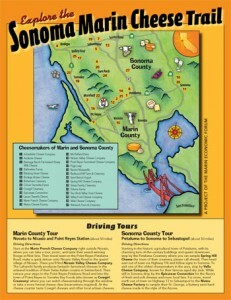 Another way to hone your cheese palate is to grab a map of the Sonoma Marin Cheese Trail (available at Petaluma Market, the Petaluma Visitor Center, and local dairies;) and go visit the cheese makers themselves. The map features 27 local dairies and cheese businesses; it gets you started with some basic cheese terms and tells you who is open to public or by appointment and what kind of cheese they make (cow, goat, sheep, or water buffalo!). 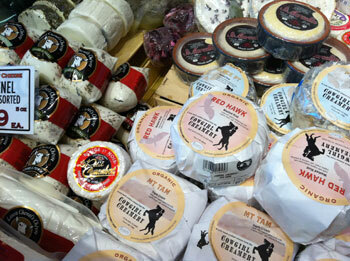 Spring Hill Cheese Company, Cowgirl Creamery in Pt. Reyes, Nicasio Valley Cheese Company, and Marin French Cheese are open to the public year round. Cowgirl also has seasonal tours of their Petaluma facility, with the next series starting in spring 2012. Also keep an eye out for special tours available on Farm Trails days. After some touring and tasting you will have your cheese chops sharpened and will be ready to tackle the annual California Artisan Cheese Festival coming up in Petaluma in February 2012. It is already in its sixth year and gets bigger each time. There you will find cheeses to taste from up and down the west coast, chef demonstrations, diary tours, and seminars. The tours at this event are so popular that they sell out quickly, prompting the organizers of the event to launch year-round Cheese Country Tours in our area. Join their email list for updates. Marie Schmittroth notes how much the local cheese industry has changed in recent years, “It is exciting to see people bringing old world ideas to new world cheese”. She sees more local dairies looking to expand into cheese making, more open houses; the industry is becoming more accessible. Whether you are already a cheese enthusiast or have never tasted anything beyond cheddar, our local cheese industry is providing opportunities to train your taste buds and savor the creations of our burgeoning region of cheese makers. Enjoy!